Polyurethane Sheet is an organic polymer formed by reacting an isocyanate with a polyol in the presence of a catalyst and other additives. 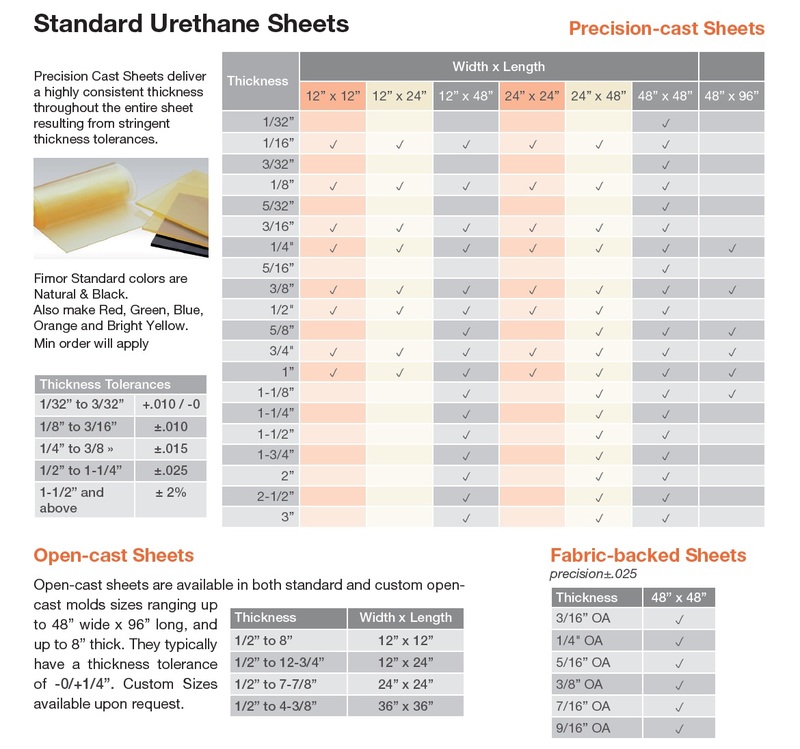 Polyurethane formulations cover an extremely wide range of stiffness, hardness and densities, and include low-density flexible and rigid foams, soft solid elastomers and hard solid plastics. Uses include high-resiliency flexible foam seating, rigid foam insulation, elastomeric wheels and tires, high-performance adhesives and sealants, seals, gaskets, carpet underlay and flexible to hard plastic components. The pioneering work on polyurethanes was done by Otto Bayer and his co-workers in 1937, although significant commercial production did not occur until 1952, due to the constraints of World War II. Other early pioneering work was done by DuPont, BASF, Dow and Mobay. Manufacturing: Polyurethanes are in a class of compounds called reaction polymers, which include epoxies, unsaturated polyesters and phenolics. Commercially, polyurethanes are produced by reacting a liquid isocyanate with a liquid blend of polyols, catalyst and other additives. The first essential component is the isocyanate; molecules containing two isocyanate groups are called diisocyanates. These molecules are called monomers since they themselves are used to produce polymeric isocyanates. Isocyanates can be classified as aromatic, such as diphenylmethane diisocyanate (MDI) or toluene diisocyanate (TDI); or aliphatic, such as hexamethylene diisocyanate (HDI) or isophorone dissocyanate (IPDI). Volume wise, aromatic isocyanates account for the vast majority of global diisocyante production. The aromatically linked isocyante group is much more reactive than the aliphatic group, and is more economical to use. The second essential component is the polyol. Polyols extended with propylene oxide (PO) or ethylene oxide (EO) are polyether polyols. Polyols formed by polyesterification are polyester olyols. The choice of initiator, extender and molecular weight of the polyol greatly affect its physical state, and the physical properties of the polyurethane polymer. Characteristics: Cast polyurethanes, along with rubber, belong to a family of materials known as elastomers. When these materials are deformed, stretched or compressed, they return to the original shape once the force is removed. This characteristic holds true throughout their hardness range. One major distinguishing characteristic of polyurethane cast shapes is that they are available in a variety of durometers. Durometer is a measurement of the relative hardness as shown in Figure 7.5. Note that polyurethanes can be very soft (such as in a Shore 20 A shape) or very hard (as in a Shore 75 D shape). Properly specifying the optimum isocyante, polyol, curative and durometer yields customized performance characteristics for even the most demanding applications. Polyurethane competes mostly with, or replaces, traditional materials such as steel, aluminum, ceramic and rubber. They also sometimes replace UHMW and other plastics in applications which dictate the need for a product with superior tear and abrasion resistance, or which need a product that can be easily bonded to a substrate. Polyurethanes also exhibit excellent load bearing and flex fatigue; they also resist compression set. Markets and Applications: Major markets for cast polyurethane shapes include: automotive, aerospace, electronics, defense, power presses/dies, mining, paperboard, material handling, metal finishing, pulp and paper, oil and gas, automated filling plants and railroad. Some typical applications include: • Arc shield in railroad cars, replacing fiberglass parts which exhibited frequent and premature breakage resulting in excessive maintenance costs. • Gaskets and seals, replacing synthetic rubbers when a combination of chemical resistance and outstanding toughness are required for specialty applications. Custom seals can generally be made using relatively low cost tooling. • Cutter bars in paperboard plants, replacing UHMW-PE cutter bars which often needed replacing. • Wheels for carts and trolleys in automotive and other manufacturing plant use, replacing rubber. Polyurethane wheels have higher load bearing capacity and roll easier. The figure below shows the spectrum of the wide range of hardness values and a few examples of applications.